Although I am right on schedule with this project, it feels like its taking forever! It’s a semi-enjoyable, semi painful kind-of-forever, and I’m glad the payoffs make it seem worth it thus far. Let me get you guys up to speed. Since last week I tiled one side of the shower stall. It’s not just one side though, it’s one side with a soap niche. Who would have ever thought that one niche would take so much planning, but it did. 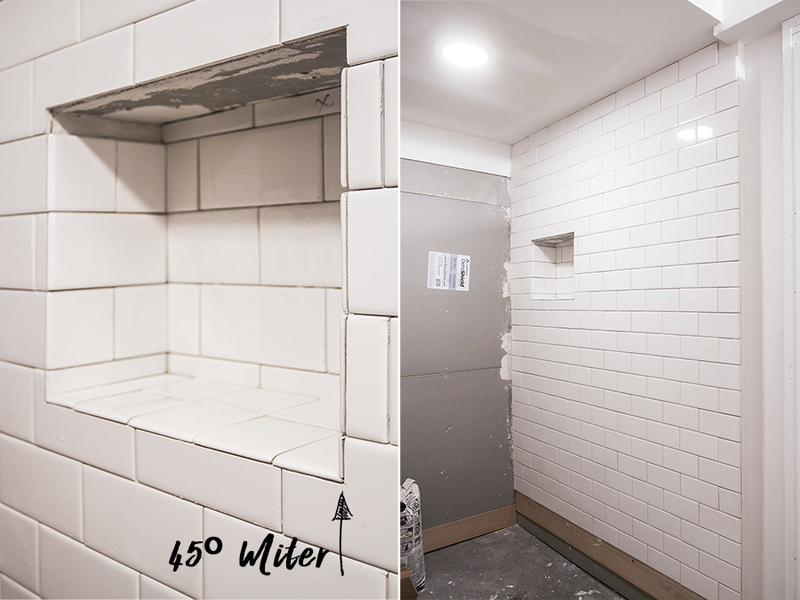 After staring at hundreds of images on pinterest and considering all of the different ways to approach a niche, I decided the best way for this shower would be to use the bullnose tiles that I had used for the edges of the shower to create an edge, and then to continue the running bond pattern along the back of the niche. That all seems pretty straightforward, except for the fact that I didn’t want the tile to run into the niche at a weird intersection. With a lot of planning I decided it would be best to have a row of the running bond pattern to meet directly in the horizontal middle of the niche. Have I said before how I would be nowhere without my laser level! Listen up! 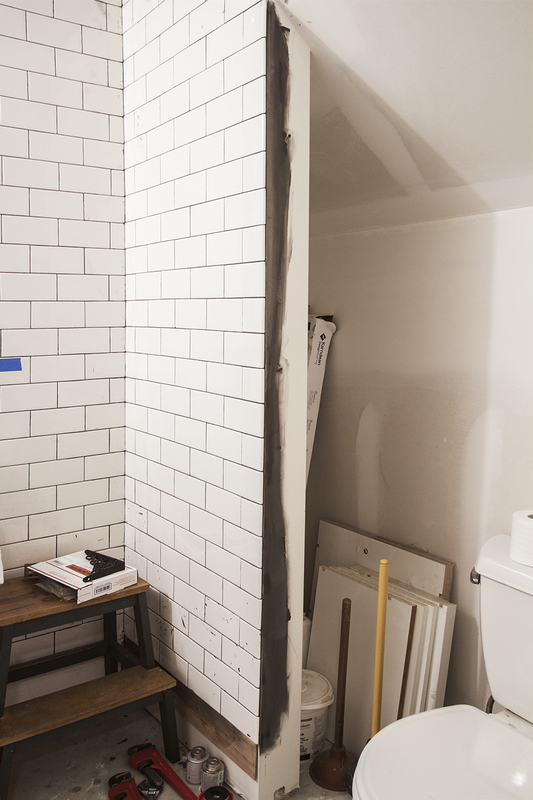 Please put it at the top of your shopping list if you have a tiling project in your future. I used the level to find my niche’s horizontal middle, and then measured backwards down the wall towards the floor to find my beginning row. PS, I started my rows using ledger board to keep my first row nice and level. 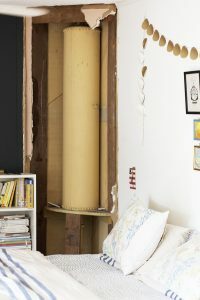 Did I say that I majorly over-thunk and planned out every last detail of this niche. I was all in, so I mitered the corners to give it a super pro look. In the photo on the right you can see the bullnose on the edge of the shower that I mentioned earlier. I am just using cheap-y dal-tiles from the Home Depot and I was able to find a bullnose tile on the short 3″ side of the tile, instead of the long 6″ tile on Wayfair. You often see edges finished with the vertical 6″ edge done in a border, but I preferred the look of the short bullnose for my edges. I added a bit of a pitch from the left side down to the right and from the front to the back, made easy again to my LAZER! This is the opposite wall of the shower stall. 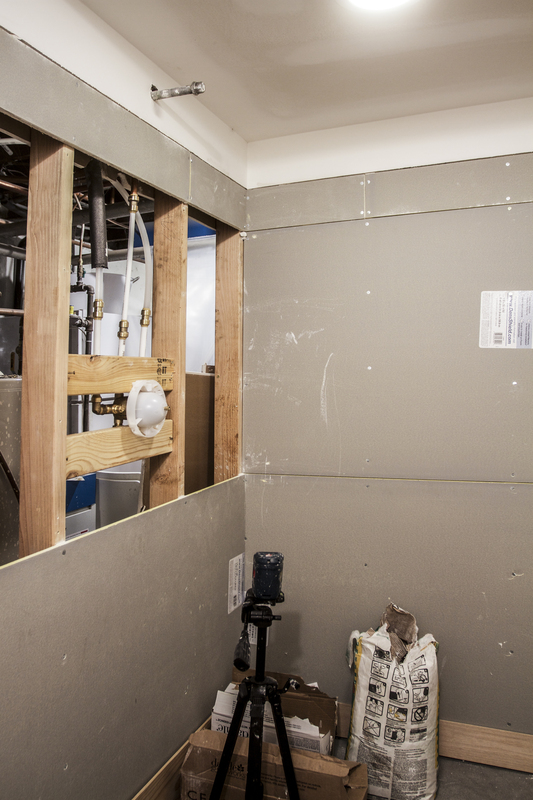 I had to remove the cement board from the shower side and drywall from the utility room side to access the plumbing for the shower valve. The shower valve plumbing had been roughed in, I had a hot and cold line and copper coming down from the stem for the shower head, it all just needed a valve. I put on my plumber pants and started doing some research. After considering using pex and sweating copper I discovered a miracle plumbing tool for the DIY’er called “Shark Bite“. 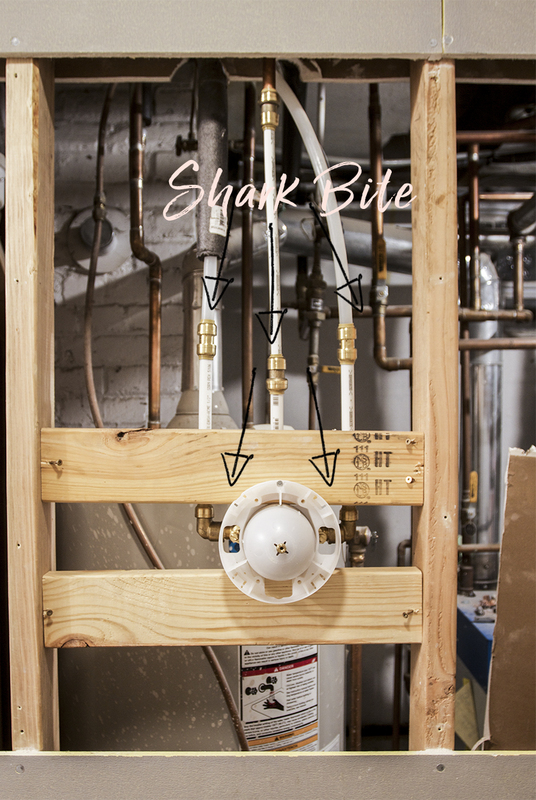 Shark Bite is a push-to-connect plumbing system that can link pex, copper and cpvc. They even have a plethora of fittings that are threaded male or threaded female parts so you connect things such as your shower valve! The downside is that if you were working on plumbing every day that the Shark Bite would cost you over time, one brass connection runs around $7.50, however I wasn’t in the market for buying a torch or a pex clamp so the Shark Bite did the job. Also super easy and nearly stress free. Next I’ll be re-installing the cement backer and getting ready to tile and add the dream Kohler shower head and trim v soon! Here is the sink from a different view (taken directly from the shower stall). I’m pretty sure the shower stall was too big of a mess the last few weeks to take a useful photo from this vantage point. This new photo-taking-view has allowed me to show off this corner of the bathroom. It’s nestled right below the basement staircase, next to the sink and toilet. This is where the storage for this bathroom will be. I’ll add a suitable amount of shelving and even a hamper. This will allow enough room for towels and a basket for toiletries for each kid. I’m also going to be replacing the toilet with this vintage looking one, which will add the right amount of antique style and play nicely with the sink. I can’t wait for the floor tile to be delivered so that I can see it all come together! For those who are wondering, it seems that the sink has stopped dripping on it’s own, I mean it was barely dripping anyways so… I am just going to go with that answer for now, and possibly re-examine later. Trying to cut a 45º angle with your wet saw is kinda difficult, and the internet didn’t want to give me any useful suggestions about how to accomplish this — what is wrong with you internet! 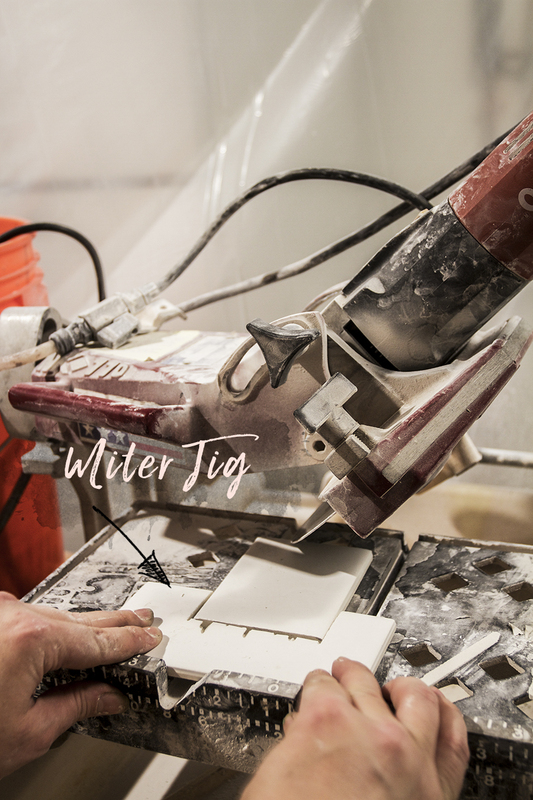 I took a second and though what would Tom Silva do and I came up with this little tile jig – cause that’s what he would do – make a jig. It’s a 3×6 tile notched out to hold a 3×6 tile the long way. 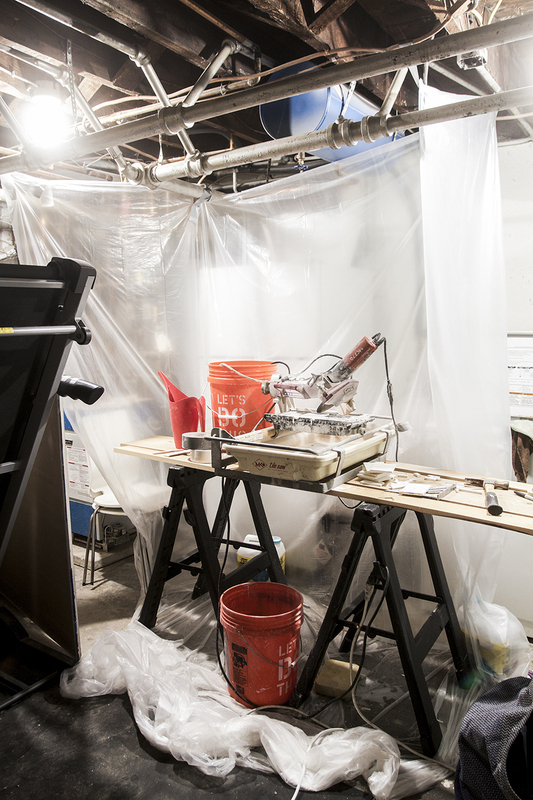 I was able to use this little set up to slide the tile right through the saw without the risk of losing a finger. Lastly, this is where I set up the indoor tile saw, right between the treadmill and the washing machine in our utility room. It’s cozy but it works and the mess is minimal. Hooray for not freezing my hands off trying to pull this off outside! Thanks to Kohler for the generous support in making this project a reality! 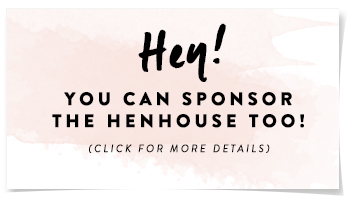 Thanks to you for supporting the businesses who support me! Thanks, Jana! I agree, for being such a small space, how can the jobs seem so big! Good luck on your project! Is this post in English? JK. 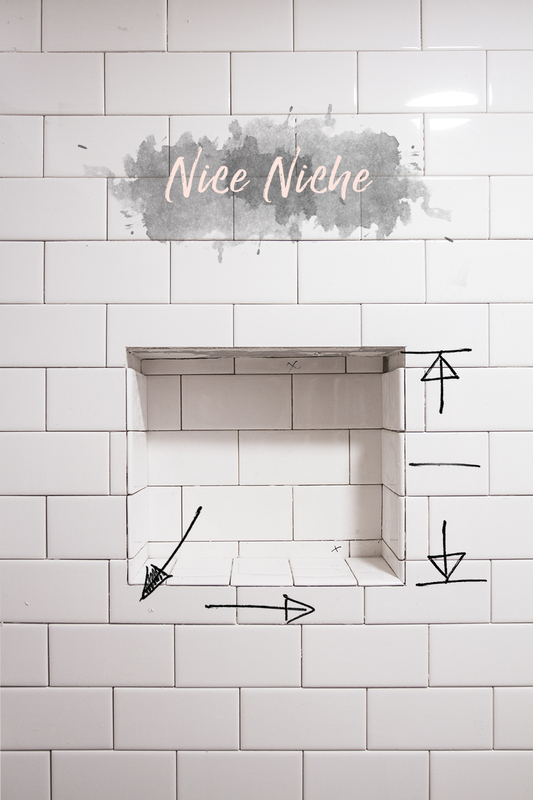 You are amazing – that niche is sooooo pro! Lookin good! I will probably be renovating a bathroom soon and seeing you do it fills me with both confidence and a healthy dose of fear. WWTSD – that is a bracelet I would wear. It would be such a good bracelet – if only! Good luck with your renovation, it is scary I agree, but sometimes diving in is half the battle. This is amazing progress. I have to ask… What font are you using to make the notations on the photos? 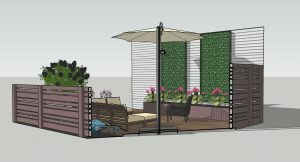 I am looking for something like that for a project I am doing for my design class. Hey Mandolin! I used a font called Lucky Fellas. I have been finding a bunch of cool handwritten fonts over at Creative Market. 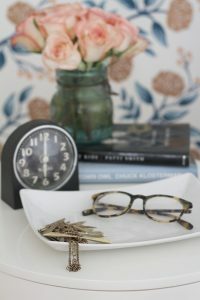 I love all the details in this post! 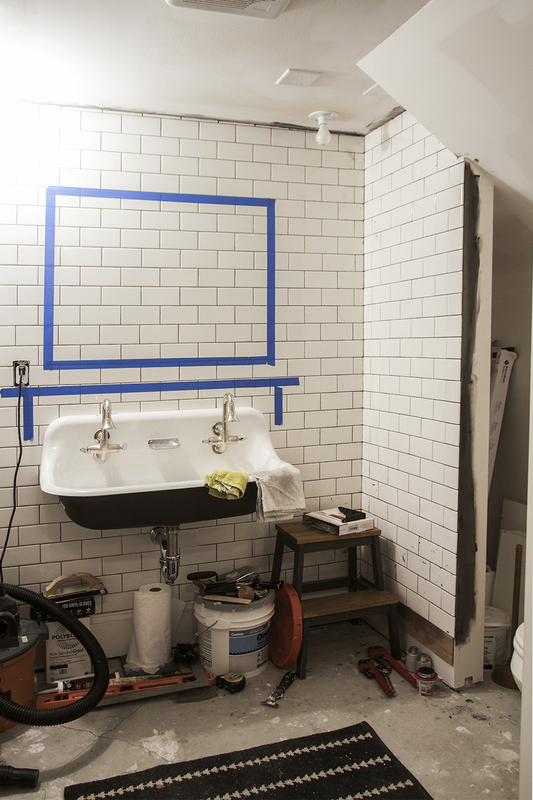 From the plumbing to the miter cuts, these are the nitty gritty details people need to learn when doing a rehab. Power to the homeowner and keep it up with these details of your progress! Will do, Julie! 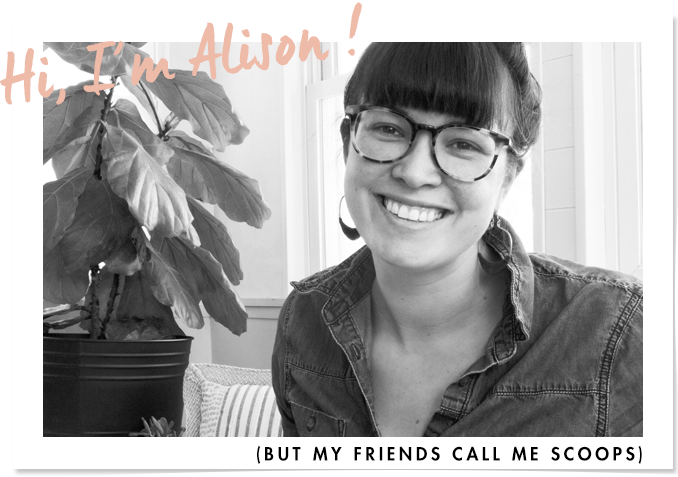 I’ve learned so many new skills on this project already – it’s been fun! Hey Kay! I checked out your blog, and I totally get what you are saying about the niche. I like your solution of using the chair rail, it looks sharp! Your reno looks great! Good information. Lucky mee I found your blog by accident (stumbleupon). Newer Post Decked the Halls & A Giveway!